Part of the winning Columbus proposal was a vision of connecting low-income South Linden residents with better means of accessing medical care, jobs, and education. This was a novel model—a transit revamp aimed at saving lives, not just commute time. A central aim: reduce infant mortality by 40 percent by 2020, the city’s existing goal. 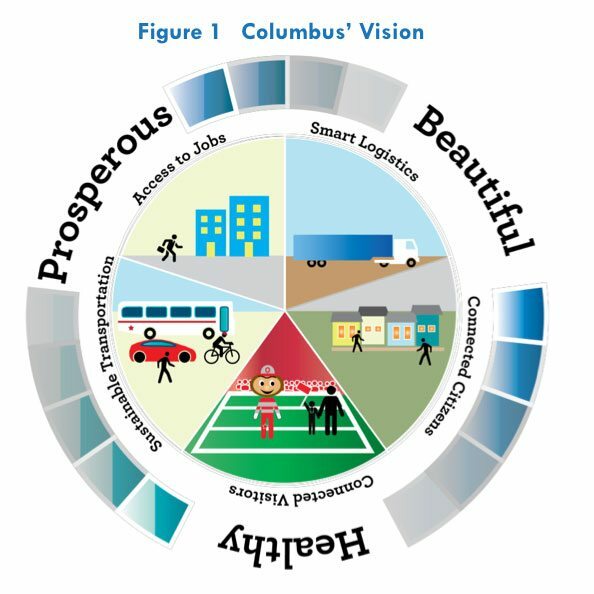 So what will life in Columbus look like? Let’s start in Linden, the heart of the city’s winning, 75-page proposal. The lower income northeastern neighborhood suffers from serious mobility issues: too few bus shelters, a lack of sidewalks and street lighting, and dangerous intersections, to name a few. Meanwhile, more than 20 of every 1,000 South Linden babies die before they turn one—almost four times the national rate—but there’s not a single obstetrics or gynecology office in the area. When it’s time for her appointment, she can board the new Cleveland Avenue bus rapid transit line. Thanks to a network of sensors that detect and prioritize transit and emergency vehicles, she’ll see nothing but green lights. In many cases, local residents don’t have credit cards, which means they cannot use ride share services. That’s a problem when their homes and their physicians’ offices may be located some distance away from bus lines. The city wants to develop kiosks where locals can turn cash into electronic currency, making ride share accessible. The plan also calls for streetlight-mounted free Wi-Fi, which could help residents connect with ride share or get information on public transportation routes and schedules. But when I ask her if new and expectant moms in Linden were truly a target population of the grant…Braun hesitates. None of the Smart City projects were ever going to singlehandedly solve for infant mortality, she says. That health crisis and the families most affected by it “are one piece of the puzzle,” she says. Broader-based investments—such as the bus upgrade along Cleveland Avenue that’s set for 2018, and universal fare cards that Braun says will eventually move forward—are supposed to indirectly serve this population. Many nonprofits support public transit in their advocacy work. But when it comes to organizing nonprofit conferences, public transit is often neglected; in fact, bus routes that could serve conference-goers are rarely even mentioned. It doesn’t have to be that way.